Sharing is more than just caring—it’s an economic phenomenon. The sharing economy is one of the fastest growing business trends in history, with investors dumping more than $23 billion in venture capital funding since 2010 into startups operating with a share-based model. Because many of these businesses are private, it’s impossible to know the actual size of the sharing economy. However, there are several clues to indicate its massive impact on our society. Airbnb ($31 million) and Uber ($72 billion) have a combined $103 billion market cap which would rank them as the 38th wealthiest country in the world. In 2016, 44.8 million U.S. adults used the sharing economy, and it’s expected to grow to 86.5 million U.S. users by 2021. McKinsey estimates that in the U.S. and Europe alone, 162 million people or 20-30 percent of the workforce are providers on sharing platforms. Trying to define exactly what the sharing economy is would not do the term justice. The sharing economy is an economic principle that is constantly evolving. In the very simplest terms, it’s the use of technology to facilitate the exchanged access of goods or services between two or more parties. It’s derived from the notion that mutual parties can share value from an under-utilized skill or asset. This value exchange occurs through a shared marketplace, collaborative platform, or peer-to-peer application. The sharing model isn’t a new concept—as many rural communities thrived off the same idea via bartering. However, thanks to the accessibility of the internet and mobile technology, managing share-based transactions has never been easier. What Is the Impact of the Sharing Economy? The sharing economy has a history of disrupting traditional business sectors. The lack of overhead and inventory help share-based businesses run lean. The increased efficiencies allow these brands to pass-through value to their customers and supply chain partners. Traditional industries are being affected by the sharing economy—and many traditional brands will struggle if they do not adapt to the changing landscape. 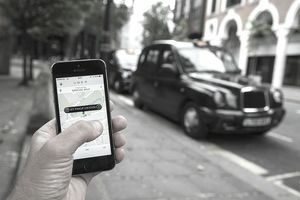 Uber’s ascension in the transportation industry is one of the best examples to illustrate the effect of the sharing economy in a traditional sector. Uber and other ride-sharing services offer an affordable, safe, and convenient alternative to traditional transportation options such as public transit or taxi cabs. By utilizing an efficient mobile application and network of vetted drivers, Uber satisfies consumers’ transportation demands while providing an arguably better user experience than traditional means. In just New York City alone, there are roughly 4.5 times more Uber drivers than yellow cabs. This has caused the price of owning a taxi cab in New York City to drop from $1 million in 2015 to less than $200,000 today. PWC research suggests that 86 percent of U.S. adults familiar with the sharing economy say that it makes life more affordable and 83 percent also agree that the sharing economy is more convenient and efficient than traditional methods. Affordability, convenience, and efficiency are also three of the most influential factors in a consumer goods purchasing decision. Therefore, it’s no surprise that share-based brands are also dominating the consumer goods industry. eBay is one of the pioneers of the peer-to-peer marketplace. Their innovative platform allows users to buy and sell used or new items through their interface, and have the goods shipped directly to their home. Consumers can browse a variety of products at custom price points, in various conditions, and with different guarantees. This empowers the consumers and provides them with a more affordable, convenient, and efficient way to purchase goods. The benefits of the sharing economy are best illustrated in the professional and personal services space. Professional and personal services are defined by work that requires special knowledge, skills, experience, certifications, or training like copywriters, accountants, or plumbers. In relation to the sharing economy, this is also referred to as freelancing, gigs, and other trendy terms equating to short-term labor. Powerhouses like Fiverr, Upwork, and TaskRabbit create value by providing a fast, friendly, and secure platform on which people or businesses can find contractors for hire. Freelancers can earn extra money sharing their trade skills and expertise—not unlike owners renting access to their home or car owners sharing rides. The healthcare industry is expected to generate annual revenues of $8.7 trillion by 2020. That likely explains why venture funding for digital health startups increased by 10.2 percent in Q1 of 2018 compared to Q1 of 2017. Although the sharing economy has yet to really take hold in the healthcare industry, many experts suspect it to be the next frontier for collaborative consumption. The limitations of traditional healthcare systems, expenses and resources, are factors that we’ve seen mitigated in other industries through share-based methods. From telemedicine to group-consultations, the sharing economy is destined to change the healthcare industry. For instance, it’s estimated that 58 percent of the time, medical equipment sits unused—creating storage and maintenance expenses. Therefore, share-based startups like Cohealo are helping hospitals save money and increase equipment value by developing technology that enables hospitals to share medical equipment with other healthcare facilities. What Is Next for the Sharing Economy? Technology has helped the sharing economy advance to where it is today—and, the trend should only continue as we become more connected digitally. While we’ve seen how dominant collaborative consumption can be in industries like transportation, consumer goods, and services, many other traditional sectors will soon experience changes because of the sharing economy.